This smaller version of the original Rapidfire Chimney Starter lights coals in under 15 minutes without using lighter fluid. Place canister with coals on top of Weber Lighter Cubes or crumpled newspaper and light. It's that easy. its perfectly on Smokey Joe and Jumbo Joe, and Go-Anywhere charcoal grills. Napoleon's JETFIRE Chimney Starter can light charcoal up to 30% faster than other starters thanks to the design which maximizes airflow. The angular design allows you to direct the pouring of lit charcoal with precision, while the directional shield protects your hands and arms from heat and sparks when pouring. The Pit Boss Charcoal Chimney Starter with quick burn air flow has you grilling quicker. Starting your charcoal grill has never been faster or easier. Fill the chimney starter with coals and light it. Once the coals are glowing red pour the coals into your Pit Boss Grill. Heat resistant handle and heat shield protects your hands from the heat. Starts charcoal quicker so you can be grilling faster. Wood chunks are great for adding wood smoke flavour to foods. They can also be the perfect alternative to charcoal briquettes as a heat source for grilling. Compact Rapidfire Chimney Starter This smaller version of the original Rapidfire Chimney Starter lights coals in under 15 minutes without using lighter fluid. Place canister with coals on top of Weber Lighter Cubes or crumpled newspaper and light. It's that easy. its perfectly on Smokey Joe and Jumbo Joe, and Go-Anywhere charcoal grills. Compact Rapidfire Chimney Starter is rated 4.7 out of 5 by 161. Rated 5 out of 5 by Bsmall2800 from This compact Chimney Starter works great and is perfect for... 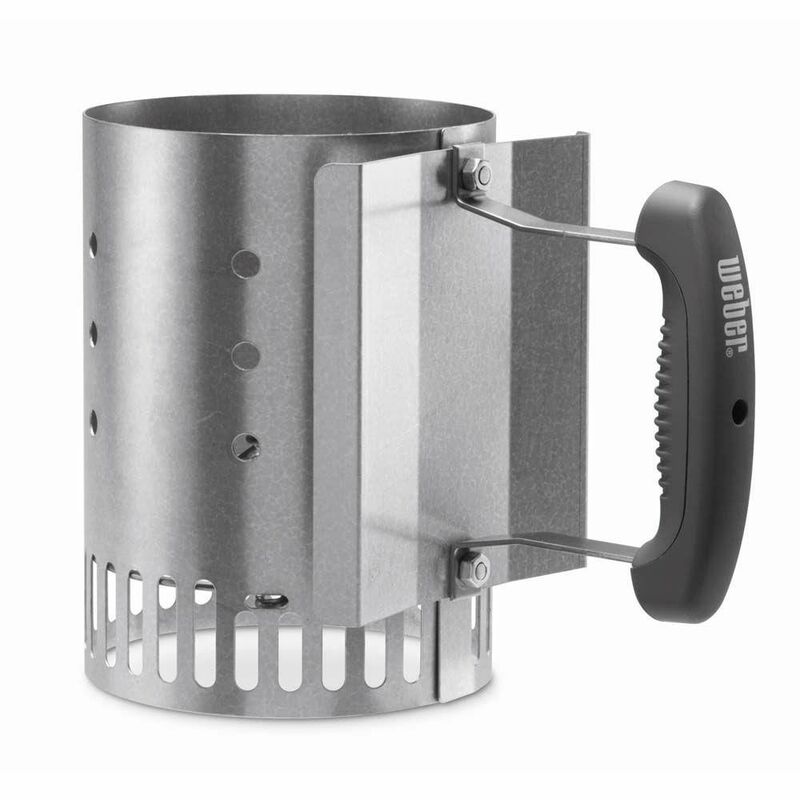 This compact Chimney Starter works great and is perfect for my junior Weber. I primarily use this one while camping with my RV. This Chimney Starter works great and highly recommend this product. Rated 5 out of 5 by Christopher from Awesome size to use with my Weber Go-Anywhere grill when... Awesome size to use with my Weber Go-Anywhere grill when tailgating! Rated 5 out of 5 by Dave from Great product fits right inside my go anywhere grill which... Great product fits right inside my go anywhere grill which is why I bought it. Rated 5 out of 5 by logan927 from It was a perfect fit for my egg type grill,... It was a perfect fit for my egg type grill, since you are not able to use lighter fluid, this product was a success.